In the chapter of neurourologic evaluation in interstitial cystitis (IC) , McGuire pointed out that urodynamic study cannot provide strong information as the first step in diagnosis of IC. The role of urodynamic study in the diagnosis of IC is still controversial over 30 years later. In order to identify the small voided volume and frequent urination in BPS patients, a voiding diary has been suggested by Payne to replace urodynamic study . The reason for this is that cystometric bladder capacity may be misleading due to psychological embarrassment and the invasive nature of the procedure. The voiding diary can reflect the true frequency episodes and functional bladder capacity and painful conditions. However, patients might not able to differentiate urgency sensation due to bladder discomfort between BPS and overactive bladder (OAB). 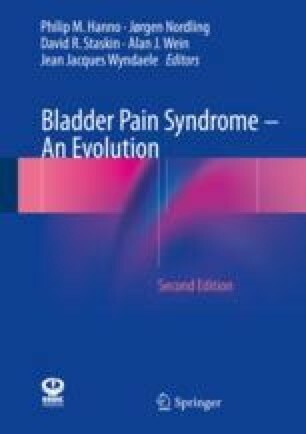 The cardinal symptom of BPS is caused by small functional bladder capacity; therefore, one might speculate that urodynamic study might provide additional information to confirm the diagnosis and make treatment strategy decisions .